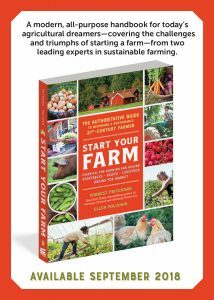 My new book, Start Your Farm, is out! Combining nearly five decades of experience from of America’s pioneering sustainable farmers, Start Your Farm is the perfect introduction for the ever-growing ranks of people who dream of starting their own successful operation. Written in straightforward yet engaging language, rich with anecdotes, practical examples, and sprinkled throughout with rural humor, Start Your Farm is a must-read primer and practical business guide for any aspiring farmer. From vegetables to livestock, from small-scale to large acreages, from West coast to East, authors Polishuk and Pritchard have not only lived the farming dream, they have succeeded at it. Now, new farmers can benefit from their wealth of experience, finding valuable information specifically organized and tailored for them. Broad in scope but thorough in detail, Start Your Farm is a book that can be read straight through, cherry-picked for individual chapters, and kept as a handy ongoing reference. Copyright © Plant To Profit All Rights Reserved Worldwide.